Arizona, the Grand Canyon State, is famous for many scenic wonders, from the Monument Valley Navajo Tribal Park, which spans parts of Arizona and Utah, to the red rocks of Sedona, to the many and varied vistas that can be enjoyed over millions of acres of desert extending all the way to the Mexican Border. For the Hollywood film industry, Arizona has also provided southwest film settings for many notable movies. Perhaps the most famous venue for early films, Monument Valley first came to the screen in Stagecoach (1939), the classic John Ford directed film that made John Wayne a star. Ford loved the expansive and breathtaking region both for its natural beauty and its inaccessibility. Without any paved road access until the 1950s, Monument Valley allowed the mercurial director to create cinema masterpieces without the interference of producers, studio executives and newspaper reports, all of whom found the difficult and dusty journey out to the set to be way too much trouble for their Hollywood appetites. Ford also shot My Darling Clementine (1946), Fort Apache (1948), She Wore a Yellow Ribbon (1949), Wagon Master (1950), Rio Grande (1950), The Searchers (1956), Sergeant Rutledge (1960) and his last western, Cheyenne Autumn (1964) in Monument Valley. This incredible land has been featured as the southwest film settings for movies as diverse as The Eiger Sanction (1974), a thriller starring Clint Eastwood, National Lampoon's Vacation (1982), and the 1960 thriller that made all of us squeamish about taking showers in strange motels: Psycho. Arizona isn't just a state of desert tableaus and striking geologic formations, however. To the north, pine trees and snow are abundant-an incongruity in light of everything we always hear about Arizona weather and its "dry" heat. The Flagstaff area, north of Phoenix and south of the Grand Canyon, has been the backdrop of many film productions. In 1941, an otherwise forgettable movie, Northwest Mounted Police, was filmed in the high country of northern Arizona. In this plot, Texas Ranger Dusty Rivers, played by Gary Cooper, supposedly traveled north to Canada to get his man. In reality, though, the length of his trek was a lot shorter. Regardless of the implausibility of the storyline and its relationships, the Cecile B. DeMille directed story managed to win an Oscar® for best film editing and was nominated for four other awards. Arizona may be steeped in the traditions of Wild West cowboys but it's been one of the southwest film settings for some rootin-tootin' galaxy adventurers, too. Consider these entries: Mars Attacks (1996), Planet of the Apes (1968/2001), 2001: A Space Odyssey (1968), Star Wars: Return of the Jedi (1983), Star Trek: First Contact (1996), Stargate (1994) and Starman (1984). In the third Back to the Future (1990) starring Michael J. Fox and Christopher Lloyd, even that time traveling Delorean got an up close and personal look at the Arizona scenery. 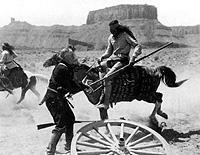 Starting with Stagecoach and the many movies directed by such luminaries as John Ford and Howard Hawks, Arizona's contribution to the film industry is still largely measured by the Western. For decades, this genre has been a boon to the economy of Arizona, whether in feature films or television shows like The High Chaparral. 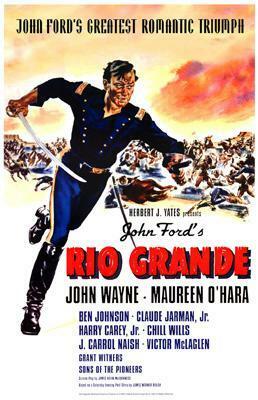 Set in Tucson, this 1960s TV series was set in Old Tucson, a movie set originally created in 1940 for the movie Arizona starring William Holden and Jean Arthur. Westerns, however, aren't the only fare that used historic Tucson as its primary set. One of the more remarkable results was The Bells of Saint Mary's (1945), the Academy Award winning film starring Bing Crosby and Ingrid Bergman. If you'll recall, the storyline unfolded in a decidedly urban-and eastern-town. Old Tucson and Old Tucson Studios survived a serious fire in 1995 and remain important southwest film settings for films and television shows. It is aptly named Hollywood in the Desert. Over time, many films have been made depicting exotic locales in India and North Africa. Many of these were shot in and around Yuma, Arizona. Yuma is situated at the far southwestern tip of Arizona, resting on the border with Mexico. The first film shot there, Son of the Sheik (1926) starred none other than Rudolph Valentino. Seventy five years later, the sand dunes of the Yuma area became the backdrops of a different kind of heartthrob: Dwayne "The Rock" Johnson, the muscular star of The Scorpion King (2002). Other notable films shot there include the original of The Four Feathers (1927), Three Kings (1999), and three iterations of Beau Geste (1926, 1939, and 1966). Gunga Din, the 1939 adaptation of the Rudyard Kipling novel that starred Cary Grant and Joan Fontaine was shot there, too. Over the decades, the economics of film production have dictated many changes. Runaway production - where studios film outside the United States to save costs - is a reality that has affected the economies of many states that in the past were premiere locations for film and television shoots. While the film industry looks at the Grand Canyon State differently now than it did in its formative years, the natural beauty and history of the Southwest still remain. When Stagecoach was filmed, its economic impact was a blessing to the Navajo nation. Today, the economic boon created by film and television production is still highly coveted, and states and local governments are very accommodating if there is a chance to host the production of a film or television series. For a full list of films that have been shot in Arizona and the Southwest, AZ Central is a great site to bookmark. To find out what opportunities and support Arizona extends to film production, visit Arizona Production Association and contact their Office of Film and Digital Media.